September 2018 Update: Guest Blog Post, Industry News, and Discount Books! Without an appropriate Inventory Planning and Forecasting Policy you can’t properly manage your inventory levels, let alone optimize them. If you don’t have a handle on exactly how demand forecasts and stocking parameters (such as Min/Max, safety stocks, and reorder points, and order quantities) are determined then you don’t really have an inventory planning and forecasting policy. In our latest guest post, Gregory Hartunian, CEO of Smart Software explains why inventory planning and forecasting work-arounds don’t work and how a lack of an inventory planning and forecasting policy can blow out costs. Sphera, the largest global provider of Integrated Risk Management software and information services has announced the acquisition of sparesFinder, a leading U.K.-based Maintenance Repair & Operations (MRO) cloud-software company. Smart Software, Inc. is excited to announce the successful integration of its cloud-based Inventory Planning and Optimization software with Microsoft Dynamics NAV to create Smart IP&O for NAV. Smart Software partnered with ArcherPoint Inc., a Microsoft Dynamics ERP Gold Partner and full-service provider for Dynamics NAV and Dynamics 365 to build the connector. Smart Software is a global provider of next generation 100% web-based demand planning, forecasting, and inventory optimization solutions. ArcherPoint created the connector to integrate Smart Software’s tools with Microsoft Dynamics NAV. The new integration brings the cloud-based Smart IP&O (Inventory Planning and Optimization) into the latest version of Microsoft’s ERP solution. By seamlessly integrating strategic planning in Smart IP&O with operational execution in Dynamics NAV, business users can continuously predict, respond, and plan more effectively in today’s uncertain business environment. Continuing this series on 7 Things That Every Senior Manager and CFO Should Know About Spare Parts Management this post addresses Part 2: You Will Need to Hold Items That Will Not Move Often (If at All). 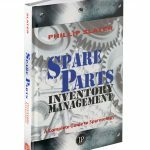 At the time of writing, Amazon.com is offering a 20% discount on the hardcover version of my book Spare Parts Inventory Management. This means that you can purchase the book for just US$39.94. What a bargain!